Average Series A valuations have hovered around $15M for the last 9 quarters. Series B rounds have settled into $50M, while Series C rounds have rebounded to $100M. Later stage rounds, however, have fallen by 50% from their high of $400M to just under $200M. 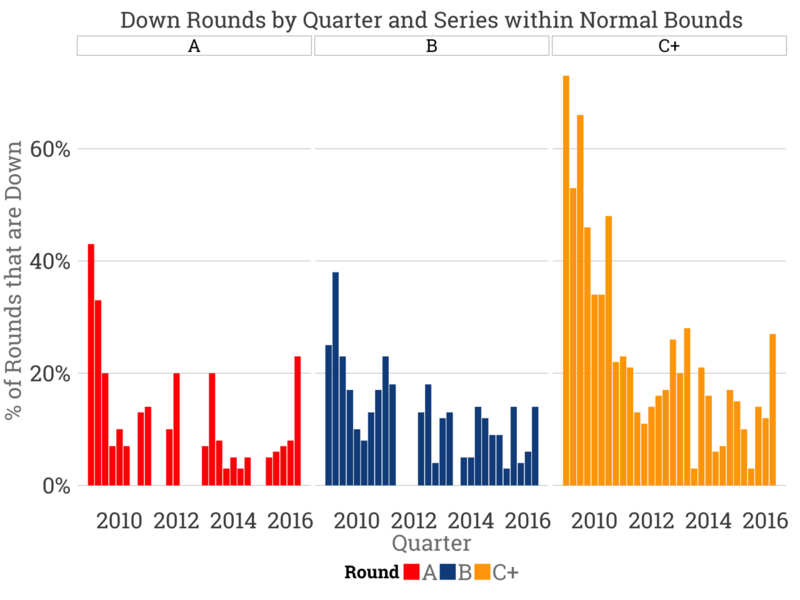 However, in the early stages the frequency of down rounds (e.g., a Series D with a smaller valuation than a Series C) aren’t at historic or even six year highs. Series A down rounds constituted 40% of all rounds in Q1 2009. Today, that figure has touched 23% and compared to the previous three quarters’ average of 7% is certainly a notable spike. But it’s not a compelling if it’s a single data point, because the market reached this level in Q2 2013 and Q1 2012. This spike is a reflection of the expensive seed stage market in the last few years, and is likely a reversion to the mean at that stage. Series B down rounds haven’t increased as a total share. Series C and later down rounds have surged and are higher than recent quarters, but not an aberration when looking at the six year history. In other words, the fundraising market is quite steady and relatively stable. Prices seem to have found at least a temporary plateau. Down rounds with harsher terms including pay-to-play, recapitalizations, redemptions, accruing dividends and greater than 1x liquidation preferences are at some of the friendliest levels in five years. Pay-to-play: typically happens when an insider is leading the round, this provision asks other insider investors to participate or suffer heavily dilution. This heavy dilution is colloquially referred to as being washed out. Recapitalization: restructure the capitalization table for both preferred and common as part of a financing. This washes out the previous shareholders to start again with a nearly-blank slate. Redemption: an investor can demand the company pay them back the value of their shares at some point in time. Accruing dividends: The equity investment doesn’t just buy shares, but the investment also receives an annual interest rate that is paid out at the shareholder’s request. Accruing means this amount compounds annually. Liquidation preferences: In the case of a 2x liquidation preference, preferred shareholders are paid twice their initial investment and then paid their ratable share of the remaining proceeds. Liquidation preferences can have many different structures and payment mechanisms. They are very important to understand. 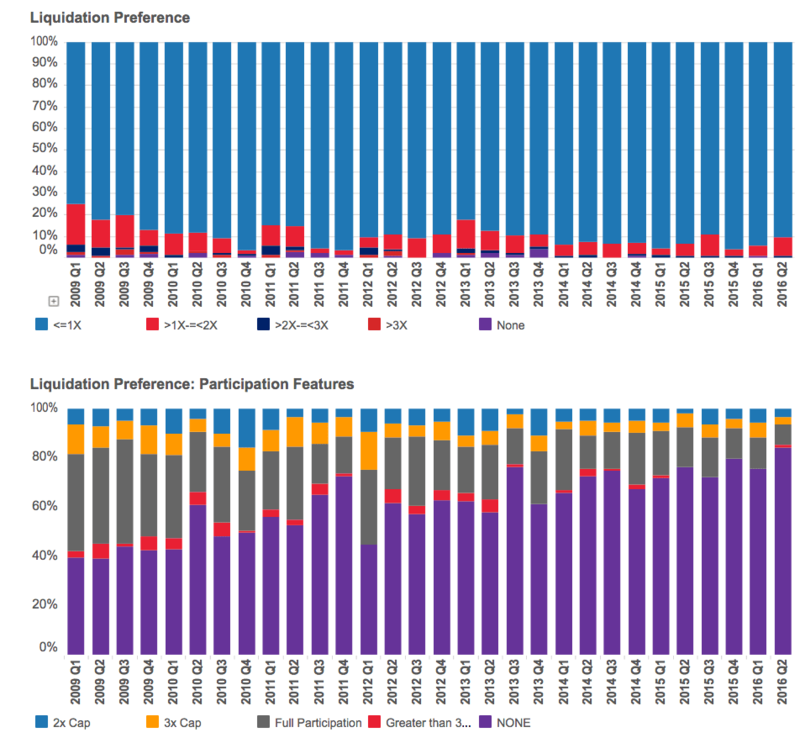 Cooley’s data indicates the supply of venture capital dollars exceeds founder demand and VCs are competing by continuing to offer very founder friendly terms, even in down rounds.